Thomas H. Webb, secretary of the New England Emigrant Aid Company, wrote from Boston, Massachusetts to Martin F. Conway, general agent for the New England Emigrant Aid Company in Kansas Territory. Webb informed Conway of the Company's desire to end its operations in Kansas as soon as possible. He recommended that Conway sell the Company's mill equipment at a low price and suggested that he sell it to the Batchelder Town Company. 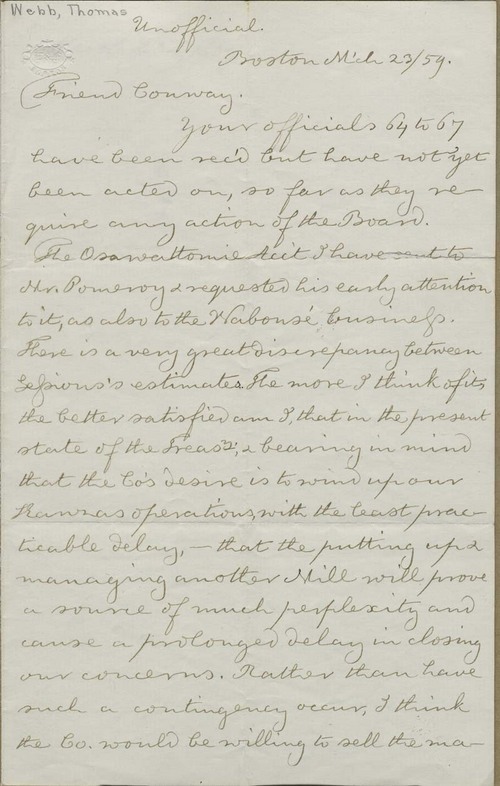 In a postscript, Webb urged Conway to prepare information to present to the territorial legislature related to Company claims for losses during the early territorial troubles, particularly for losses incurred during the May 1856 sack of Lawrence.